We’d love your help. Let us know what’s wrong with this preview of After the Rain by Elizabeth Johns. Forced to leave the girls' school where she has spent the past six years as an orphan, Christelle Clement tries to find work in Paris. When her mother’s reputation as a high-paid courtesan precedes her, Christelle decides to go to England in search of the father she has never met. A humble gentleman, Dr. Seamus Craig is in search of a wife who can provide him with the fami Forced to leave the girls' school where she has spent the past six years as an orphan, Christelle Clement tries to find work in Paris. When her mother’s reputation as a high-paid courtesan precedes her, Christelle decides to go to England in search of the father she has never met. To ask other readers questions about After the Rain, please sign up. This one had some interesting dynamics. It played with social classes and roll reversals. I love that the hero wasn't smarmy. He was just a genuinely nice guy. And I do love nice guys. Elizabeth Johns is one of my favorite romance authors and her sweet historical romances are always charming and enjoyable reads. I love how she focus on the development of her characters through tragedy and trial and we have the privilege of going along on their journey. After the rain is the second book in the Descendants series and the first two books have focused on the off springs of Lord and Lady Craig. As their children grow up they have to navigate the minefield of finding love in English Elizabeth Johns is one of my favorite romance authors and her sweet historical romances are always charming and enjoyable reads. I love how she focus on the development of her characters through tragedy and trial and we have the privilege of going along on their journey. After the rain is the second book in the Descendants series and the first two books have focused on the off springs of Lord and Lady Craig. As their children grow up they have to navigate the minefield of finding love in English society, much like their parents before. Seamus Craig is finally living his dream of being a practicing Doctor. Has has moved to London to try to further his career, but Seamus has learned that his career is not all that he desires. He desires to fall in love and to have a family of his own. what I loved about Seamus, was he was a regular guy just trying to make his name in the world. He wasn't caught up in the trappings in society and had no desire to live a crazy and wild bachelor lifestyle so many of his peers were living. While I always love reading about a good rogue, my heart will forever belong to a good guy and Seamus had my heart. Seamus begins to suspect finding a wife will be harder then he thinks when he has a run with a Christelle on a rainy day. Christelle has just arrived from Paris and is in desperate need for help. She has traveled to London to try to find her father and is all alone in the world. Christelle is a brave girl. refusing to let the life she was forced to live break her spirit. She has been left all alone for a number of years, but she is always making the best of the situation. Also Christelle and Seamus had such a meet cute moment and you can see the instant chemistry between the two. I loved watching Christelle and Seamus get to know each other and slowly falling in love, but they are both a little to scared to do anything. Once Christelle's father is revealed it changes everything for these two. Christelle Clement knew her stay at the Harriet School for girls was temporary at best, but the timing of being turned out couldn't have been worse. She had no family since the loss of her mother six years ago, no place to go, and not a cent to her name. The headmistress gave Christelle a trunk of her mother's things that she had saved for her. Thinking there could be something that might give her direction, Christelle searched the trunk, emotions barely at bay as she moved through her mother's Christelle Clement knew her stay at the Harriet School for girls was temporary at best, but the timing of being turned out couldn't have been worse. She had no family since the loss of her mother six years ago, no place to go, and not a cent to her name. The headmistress gave Christelle a trunk of her mother's things that she had saved for her. Thinking there could be something that might give her direction, Christelle searched the trunk, emotions barely at bay as she moved through her mother's beautiful gowns. Christelle thinks perhaps she could remake them to fit her. In survival mode, her thoughts briefly turned to her mother's occupation- a paramour. She had certainly observed her mother's ways, but lacking her mother's confidence, she knew that her mother's life wasn't for her. However, Christelle knew she did possess her mother's uncommon flair for design and sewing. She decided to pursue that path and hoped she could find a job as a seamstress to support herself. Before closing the trunk, she discovered an old sheath of paper with her name and birthday. Benedict Stanton was listed as her father! This gave her hope. She decides to find father- if he is still alive- and at least decide whether she wants to know him. Hating the name Clement, she quickly decided to use her real last name. Clement was her stepfather, a man that had only been mean and scary to her as a child. Stanton had to be English, so she decided to head to London. The trip from Paris to London was hard- but she meets Seamus Craig and discovers kindness and more assistance than she ever anticipated. Dr. Seamus Craig, a man who himself had been an orphan, discovers Christelle in distress on a bridge in the rain. He fears for her and convinces her to come with him. After meeting Christelle and finding out what she wanted to do, he meets with his Grandfather to see if he can help her get started in London as a seamstress. The more time they spend together, the more they find common ground. His Grandfather comes through and refers Christelle to a seamstress for an interview. The owner of the shop recognizes the dress Christelle was wearing, shocked to see the daughter of her former friend. She hires Christelle, and lets her know that she knew her mother. This is the same modiste that sews for Seamus' mother and her sisters. Settled, Seamus and Christelle turn their attention to their friendship, both secretly hoping to see where it could take them. Just as life seems to have righted itself, Christelle meets someone that turns both of their lives upside down, and threatens their very friendship. Will they be able to hold onto their feelings for each other, or will the upheaval that London brings snuff out any chance for love and happiness? Elizabeth Johns' has done it again. This is a sweet romance that I honestly couldn't put down until the last page. I adored Christelle's sweet character- a young woman unblemished by tragedy and hopelessness. Seamus could be her perfect hero- but only if they can find their way to a happy ending. I really liked “After the Rain”! For those of us who read Regency England stories and have many - some of us can claim a ridiculous amount in our reading history; it’s refreshing to find a new twist. And that is exactly what Elizabeth Johns has done with this plot. Grabbed my attention right away and never let go! Sixteen-year-old Christelle is forced to leave the girl’s school in Paris she has called home for the past six years. Her mother is dead and the school no longer has funds to sponsor he I really liked “After the Rain”! For those of us who read Regency England stories and have many - some of us can claim a ridiculous amount in our reading history; it’s refreshing to find a new twist. And that is exactly what Elizabeth Johns has done with this plot. Grabbed my attention right away and never let go! Sixteen-year-old Christelle is forced to leave the girl’s school in Paris she has called home for the past six years. Her mother is dead and the school no longer has funds to sponsor her. She is sent off with a trunk from saved from her mother, which upon closer inspection reveals Christelle’s birth certificate and her father’s ring. She sets off to England to locate her father. Arriving near destitute in England, Christelle has the good fortune of meeting Dr. Seamus Craig who is kind enough to help the poor young woman. Christelle finds her father and becomes interestingly entwined with a vary unique family. It’s a journey that easily slides Christelle and Dr. Craig into your heart and soul. By itself, this is a good story, but if you have read all the previous books that connect the characters and family members, it’s a richer experience. I definitely encourage getting them all, then stacking them up in order, and have at it Regency lovers! Elizabeth Johns has written another wonderful story again! How does a young lady move forward after her mother passes away and she discovers who her real father is? Traveling from Paris to London is a frightening thing for anyone to do when they have to support, but Christelle Clement makes that leap. In what seems to be her darkest hour for Christelle, an unexpected encounter on a bridge with Dr. Seamus Craig is a godsend to her, and it leads to interesting things. Will Christelle find her fath Elizabeth Johns has written another wonderful story again! How does a young lady move forward after her mother passes away and she discovers who her real father is? Traveling from Paris to London is a frightening thing for anyone to do when they have to support, but Christelle Clement makes that leap. In what seems to be her darkest hour for Christelle, an unexpected encounter on a bridge with Dr. Seamus Craig is a godsend to her, and it leads to interesting things. Will Christelle find her father along with a new life? Will she ever see Seamus after that fateful night? Read this story to find out what happens next. After the Rain, is a beautiful story, written by Elizabeth Johns. I really enjoyed it, but preferred her first story, Out of the Darkness, of the Descendants series! This is the clean and sweet story of two beautiful characters named Christelle Clements and Dr. Seamus Craig. The heroine has spent six years in an orphanage, now she must leave and start on her own. Enters Seamus in her life, in need of a wife. 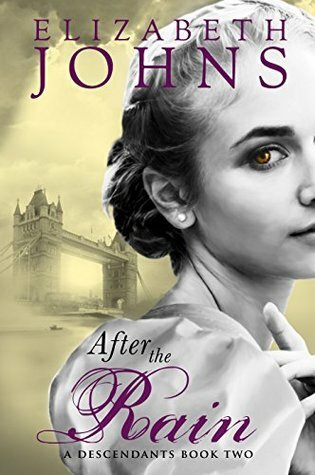 Their story has a slow pace and well written, but I felt it needed more romance, but tha After the Rain, is a beautiful story, written by Elizabeth Johns. I really enjoyed it, but preferred her first story, Out of the Darkness, of the Descendants series! This is the clean and sweet story of two beautiful characters named Christelle Clements and Dr. Seamus Craig. The heroine has spent six years in an orphanage, now she must leave and start on her own. Enters Seamus in her life, in need of a wife. Their story has a slow pace and well written, but I felt it needed more romance, but that's me! The world of the Descendants series is still best appreciated if you read the books of the generation that came before these (although these focus do far on the adopted children of Lord Craig, so the age difference between the previous main characters and these are not a full generation). Descendants 2 is more of a full novel than Descendants 1, although it is still quick read. Both protagonists are lovely and interesting people. Looking forward to Maili and Interesting. Engaging Main Characters. It was really good and I really enjoyed the continuation of these characters and would have given it five stars but for some reason the ages and dates of the main characters didn't coincide with the characters of the Melting the Ice novel, maybe it was just me but it didn't seem to work out numbers-wise/ages/amount of time passing and that was a distraction to the story. I finally had to stop dwelling on it and just read it, a great story, love Elizabeth Johns! This is the second book in this series and it centred around characters that weren't introduced in book one. It makes this book hardly enjoyable. I cannot follow the characters backstory half the time. My favorite in this series so far! Thoroughly enjoyable installment in a series I have very much enjoyed. I love the continuation into this, the second generation of what feels like extended family members! I love these characters! I really enjoyed this book, and it has been fun reading the descendants trilogy. As always, this book has the romance, suspense, mystery and drama all wrapped together. Above all, it was a clean read! I remember reading this, and I remember being slightly underwhelmed. It was nice to read mostly because it revisited characters that I already loved. This is a fun branch off of her Elements series. Can't wait for the next one. Like many writers, Elizabeth Johns was first an avid reader, though she was a reluctant convert. It was Jane Austen's clever wit and unique turn of phrase that hooked Johns when she was "forced" to read Pride and Prejudice for a school assignment. She began writing when she ran out of her favorite author’s books and decided to try her hand at crafting a Regency romance novel. Her journey into pub Like many writers, Elizabeth Johns was first an avid reader, though she was a reluctant convert. It was Jane Austen's clever wit and unique turn of phrase that hooked Johns when she was "forced" to read Pride and Prejudice for a school assignment. She began writing when she ran out of her favorite author’s books and decided to try her hand at crafting a Regency romance novel. Her journey into publishing began with the release of Surrender the Past, book one of the Loring-Abbott Series. Johns makes no pretensions to Austen’s wit but hopes readers will perhaps laugh and find some enjoyment in her writing.